Crest is currently hunting Eevee. 6 months later after my saying, yeah I need to get on more. I'm sorry all! Hope everyone who still remains is doing well! Interact with the Wounded Sigilyph in my party AND share this status or hashtag to try and win! I have decided to shiny hunt Zekrom, and in return, I am setting up a HUGE raffle with nearly 8.5 million PD worth of rare Pokémon up for grabs (this includes a Ditto and an Articuno in the mix!). I have set up a page for this shiny hunt and raffle. You can find all information regarding my hunt on this page here! We are currently 1 Dark Stone away from the next prize! Lannister is on the lookout for Dark Stones or Light Stones. Offering: 200 nuggets or 300K PD each. If interested just set up private ^^. More Prizes have been added. PS: Lannister would totally take donations for these noble cause. Congratulations! A shiny Zorua hatched out of one of your eggs (Chain #155)! Your PokéRadar reset and needs new batteries. Please share this hashtag for me! Now... onto the prizes, which will be shared in the comments! There will be three winners!! OK guys! Today was the result for one of the most important exam of my life. My hands are shivering as I write this. For I am the only one in my school to have cleared the exam. I am over the moon right now! Elated would be a lesser word. I am almost mad! Thus in the honour my exam results here is a giveaway for you guys. Just comment below. One user gets a grand prize of Mega Easter Lopunny. 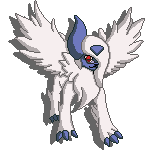 I collect Absol plushies as well! So if you give me one...THANK YOU! !